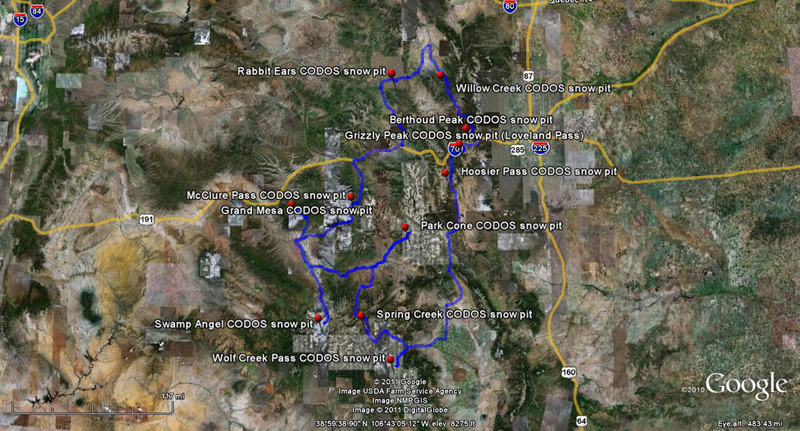 The CSAS crew has completed our first CODOS field campaign visiting all ten of the CODOS sites in our circuit and returning to Silverton on Saturday, March 17. Illness prevented one of our team from participating in the tour so we were unable to publish our findings "on the fly', site by site. Since returning we have generated site-specific Updates which are available to CODOS program participants at dust.snowstudies.org . Those site-specific reports provide descriptions of our snow profile observations, current Snotel data, photographs, and other details about snowpack conditions. The D4-WY2012 (March 6th) dust layer was found at the snowpack surface at all of our CODOS sites and on surrounding terrain, south to north and east to west - a rare (in our experience) case of the same dust layer being exposed statewide, simultaneously, in March, ten days after deposition. The heaviest depositions of D4 were observed near Muddy Pass and the east side of Rabbit Ears Pass, and on Grand Mesa. Several sites also presented other dust layers in the lower half of the snowpack, including what appeared to coincide with the D1 layer near the ground. The impact of D4 on snow albedo ranged in intensity but was sufficient to result in additional absorption of solar radiation at all locations; all sites exhibited significant melt/freeze activity in the upper snowpack and many sites showed deep infiltration of free water and wetting fronts. As a result of dry and warm weather, and reduced snow surface albedo over an extended period (March 7-17), and resulting flux of heat into the underlying snowpack (as free water), some CODOS sites have become or are very nearly isothermal at 0 C throughout, including Wolf Creek Pass, Willow Creek Pass, Rabbit Ears Pass, McClure Pass, and Grand Mesa. The remaining five CODOS sites including Park Cone, Spring Creek Pass, Hoosier Pass, Grizzly Peak, and Berthoud Summit, and our Swamp Angel Study Plot at Red Mountain Pass, will also quickly approach or become isothermal given another sustained episode of exposed dust at the surface, which appears imminent (see below). Since our CODOS tour we have received another significant dust-on-dust event - D5-WY2012, on Sunday, March 18. Dust fell for several hours entrained in Sunday's new snow (but may have began as dry deposition on Saturday night). According to early reports, this D5 dust event has fallen onto the exposed D4 surface we observed during our circuit, at most or all CODOS sites. The National Weather Service expects sunny skies and unseasonably warm temperatures to resume soon after this storm clears (Tuesday). Under the combination of strong solar radiation and warm air temperatures later this week, settlement of this dusty new snow will be very rapid and quickly merge the new D5 and D4 layers. Where snowpacks are already at or very near isothermal temperatures, solar energy absorbed by the emerging D5/D4 dust will accelerate snowmelt rates and SWE losses. Where snowpacks still retain cold content, energy absorbed by the merged D5/D4 dust will accelerate snowpack warming to isothermal. At that time, snowmelt rates and SWE losses would also accelerate, given continued exposure of the D5/D4 layer to radiative forcing.